Picture books help to reflect what children know in their own lives or to introduce them to different experiences. When it comes to representation of diversity in all forms, children’s literature can play a crucial role in a child’s life. 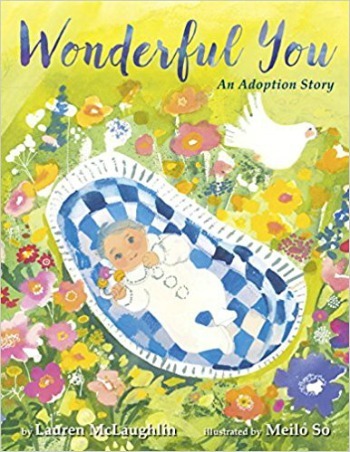 Diversity in family make-up and manner of formation is incredibly important, and in Lauren McLaughlin’s new picture book Wonderful You: An Adoption Story, one adoption story is told in a lyrical and beautiful narrative. Meilo So’s watercolor illustrations strike the perfect tone to accompany the gentle text which has a soft but steady rhythm. In this adoption scenario, an attentive birth mother searches for just the right family for her child to join, and her ecstatic adoptive parents declare their love immediately upon meeting their new baby. The new parents imagine all the days ahead of them as their child will grow, surrounded by love and joy in their family. The depictions are rendered in a fantastical manner, with the birth mother riding on a crescent moon overlooking the cities below in search for a family, which along with the poetic text makes for a story to be read aloud softly and slowly, enjoying the beauty in both. A short note from the author that precedes the story acknowledges that all adoption stories are unique, but do indeed share a feeling of being destined for one another. McLaughlin intends for this beautiful picture book to be a celebration of her own family’s journey to each other and the strength of the birth mother who made it possible. This picture book is a worthy addition to all family libraries, regardless of the way in which the family was formed! All children will delight in the joy of a loving family.